I do not know about you but I get my nostalgia kick by watching Swedish television here in the US. I love to see everything Swedish, such as architecture, nature, design, people and foodie shows of course makes me feel good and connected to my roots. SVT World has an exclusive offer in the US and Canade for their Internet Protocol Television, IPTV, this year as they celebrate 25 years broadcasting Swedish programs abroad. Via a special box provided by SVTs service partner you can stream programs to your TV up to 48 hours after they were broadcasted in Sweden. 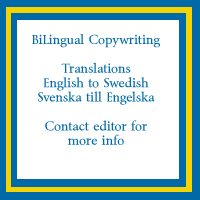 The offer includes shows, series and news produced in Sweden. Not all of us get rich, but most certainly, at some point in our lives we do get sick. Driving home from a school meeting last night I listened to young mother Stacey Lihn explaining the consequences of the lifetime cap for her family. Her speech really touched me and I am sure many other parents. Her life had been touched and saved by the new health care law that bans health care insurers to put arbitrary life time caps on benefits. Her daughter suffers from a congenital heart defect and will now receive all the care she needs under her current insurance, while if the healthcare law is upheaved by the Republicans, Stacey and her little family will not be covered as her daughter by the old law would have reached her lifetime cap by now. How low has humanity fallen in the US society to allow corporations to put a cap on some ones life. Hypocrisy beyond dignity for the so called pro-life movement to make mothers give birth to children with known heart failures and then make them watch their children die by putting a lifetime cap on their lives. I can only but quote Bernard Shaw "The US is the only country to go from barbarism to decadence without passing through civilisation". If the Republicans win this election, I am quite sure we will see the US revert from decadence to barbarism again. The Democrats did a great job, sharing this story from an American family. Politics must be more personal to engage people, today I feel engaged. H&M Grand Opening in Tampa today! Finally we get an H&M store in Tampa! Grand Opening today at International Plaza, can't wait to go there this weekend. Last Friday a Swedish woman, left her baby in a stroller outside a restaurant in downtown Amherst for 10 minutes, the police was called to the scene. The child was found to be in good health and spirits but the police had to report the incident to the State Department of Children and Families. It is unlikely though that there will be a police investigation. The Swedish woman had allegedly told the police that it was common practice in Sweden to leave children unattended outside stores and restaurants. I disagree with the Swedish woman in Amherst on two points. It is not common practice anymore to leave anything outside stores in Sweden, when I was young I used to leave my dog outside stores, but due to many thefts of unattended dogs in Sweden I never left a dog outside a store for the last 10 years I lived in Sweden, the same thing with kids, it is not common practice, at least in bigger cities and unknown areas to leave your child unattended outside stores or restaurants. If you are in another country I would say that most women, including me, would be even more cautious about the safety of your child. Having lived in Florida for some years now, I would never dream of leaving a small child unattended. What do you give to someone who has everything? I suggest Scandinavian design such as glass, jewelry or silverware. I found this ecclectic bowl designed by Ulrika Hydman-Vallien for Kosta Boda at royaldesign.com, I had it in less than five days and it was sent from Sweden. Royal Design offer brands such as Iittala, Finnish glass, Rörstrand, Swedish glass and cheramics, Orrefors, Swedish glass, Dyrberg-Kern, Danish jewelry, Mema, Swedish silverware, and more. H&M plans to open store in Tampa! Finally, real fashion is coming to Tampa Bay, H&M is planning to open a store in International Plaza, Tampa. Hopefully sooner than later so that we do not have to make the dreary drive on bad I 4 and endure the low end Florida Mall in Orlando to get to our fasion mekka. According to an article published on tbo.com the Swedish store is planning to open a store between 20,000 and 49,000 square feet which would make it one of the bigger stores in International Plaza. Step-by-step Tampa Bay is becoming a real paradise for Swedes, we have the food and furniture of IKEA and look forward to the Swedish affordable fashion of H&M, we can also celebrate our traditions with other Swedes if we want to, thanks to the hard work of the Swedish clubs in Sarasota and Tampa Bay, all this under the Florida sun and with the beautiful beaches of the Florida west coast. Gardening is so rewarding and relaxing at the same time. Planting, pruning or planning your garden is not only occupying 50% of the women in the US but also significantly increases the value of your house. The Husqvarna Global Garden Report 2011 asked 5 000 suburban home owners from 9 countries how big an impact a beautiful garden has on the overall appeal of a house, the so called Emotional Garden Effect. The US homeowners guessed an average of 26% higher market value of a beautiful garden. The Swedes guessed a 20% higher market value and the Japanese values a beautiful garden the most, guessing a nice garden can increase the market value as much as 43%. The Emotional Garden Effect was compared to the Rational Garden Effect where houseowners were asked how a garden on a real property is actually worth, US and Poland ranked highest in this estimation with a 9% of the property value. So what makes a beautiful garden, Husqvarna asked the global panel for what they found the most important garden features. Floridians - do not show this to your cat! Crazy sign number one, note the red light and the white sign saying Stop on Red Signal, do drivers not know that a red light means stop anymore? Another sign (note the pun) of the dumbing down of America. Driving in Florida is certainly an experience. The drivers here are not as well educated and predictable as the drivers in Sweden. One has to be prepared for crazy maneuvres from drivers all the time and the speed is quite high. My daughter went through drivers education in school and did her drivers test as a 16-year-old. Compared to the education and tests I went through as a teenager, I can say that the Florida teen drivers are not enough educated and prepared for being good citizens on the road. Yes, you can! Claims the new online store Swedishness.com. The store offers high quality Swedish souvenirs and gadgets, everything shipped from Sweden, but they do take orders from the USA. Guess what is hiding im my Don Juan rose? Look closely and you will see. Coctail Deluxe for 590 SEK from their web shop www.coctaildeluxe.nu but only if you live in Sweden. The other day one of my daughters went to Lowry Park Zoo for the annual Easter Egg Hunt. Honestly I do not know if she found any plastic eggs filled with candy, she did though take some cool photos of the pink flamingos at the zoo. The flamingo s like Scandinavians, are not native Floridians. The few that can be spotted in the wild, flamingos not Scandinavians, have escaped from zoo or a park and they are not believed to nest in Florida. Many species of exotic animals that are being brought here thrive in the wild, pea fowl for example, the Indian bird used as live lawn ornaments are living in wild colonies here so do pythons and parrots. The Flamingo that gets loose though tends to leave the sunshine state as soon as they can. There is a considerable amount of wildlife here in Florida. Whether your're here to relax or do some foxy gaming or you're a biologist with a keen interest in ornithological data coming out of of the state, the many species in Florida make for an interesting and unexpected sight. The flamingos that get loose though tend to leave the sunshine state as soon as they can. The flamingos kept in Zoos and private gardens all over Florida has had their wings clipped and cannot fly, just like their plastic replicas. Finally, USA steps up to the same level of healthcare as the rest of the developed western world, thanks to Obama's healthcare reform. Mandatory healthcare insurance for everyone is a step in the right direction. The health care industry, or the health care insurance companies, have spent billions of dollars on lobbying against a reform. Obviously this industry has harvested gigantic profits on the malfunctional US healthcare system. I think that for any European, socialist or capitalist, it is very difficult to understand how the US being the leading super power of the wealthy, industrialised world, has failed to provide basic healthcare to all of its people.Anyways, the bill's passage by the House of Representatives on Sunday, 219 votes against 216, is a historic victory for Obama. He has been brave enough to keep the healthcare for all Americans at the top of his agenda, for this he will be remembered forever. Yes, he could! Yourlife was launched today, web site yourlife.nu, seminars and a magazine focusing on slowlife instead of quick fix. I like the content of the web site very much, style, travel, reading, cooking with class and quality. This site really delivered what I need. This will be my everyday destination on the web. While Scandinavia is covered in deep snow and roofs are caving in from all the snow that has been falling lately, we can enjoy the best strawberries here in Florida. Only a few weeks ago we visited our first US H&M store in Orlando. Now I find out that this Swedish brand is not very Swedish when it comes to honesty, reliability and social consience They actually seem to behave like any old greedy big corporation. First they shred and destroy not sold clothes instead of donating them to charity, this during a recession and record cold winter. Talk about wasting the resources of our planet and showing total arrogance to the poor in the USA. The latest is even worst, German Financial Times has found out that H&M use Indian genetically modified cotton in their so called certified organic cotton clothes. Wow. Double your bad H&M. A sinkhole has been discovered underneath a house in our neighborhood. Horrible news for the owners that now has to dig up all the floors in the house and fill in the sinkhole. It had been a lot of talk about sinkholes since the freeze a few weeks ago when a lot of sinkholes appeared in areas where vegetable growers where irrigating their plants non-stop for days to avoid frost damages to their crop. I set out exploring the web for a charity I can give my Haiti donations to. I found Paul Farmer physician and medical anthropologist from Cambridge, Mass. Paul Farmer came to Haiti 27 years ago and should know this little country very well. His organisation Partners in Health, has been in Haiti for 20 years and did not pop up like opportunistic mushrooms to soak up money. The Partners in Health has developed a special web site for helping Haiti http://www.standwithhaiti.org/haiti. It was cold this morning indeed. A cold hail came down and created this little snow drift on our screen. Plants have been covered but I fear that after this cold spell there will be some casualties in my garden. This weather is great for hot home made soups and several cups of hot tea. Will venture out today to get a whole chicken and veggies to make a hot and hearty soup. After a wonderful two weeks of cooking and having new and old friends over from all corners of the world I feel inspired and ready for a new year. Cooking is the best therapy for me and to have good friends come over and enjoy my food is so much fun. Obviously a slight weight gain is to expect from all the social eating but I think that one week off carbs will make me lose most of the extra water I gained by eating a little bit to much. Let me start with one of the the good things that happened in the year of 2009. It was the opening of IKEA in Ybor City. I think I have visited the store for more than ten times already and always found something cool and useful to buy besides the Swedish coffee and Kalles Kaviar. This year I have as every year met a lot of new, friendly Scandinavian people, it is great to be a part of the Scandinavian community here in Tampa Bay. We do have a lot in common and it is great that we can support eachother in so many ways. I and my daughters had never visited an H&M store outside Sweden before so we decided to make a trip to Orlando. It took us hours to get from Tampa to the Florida Mall in Orlando, the traffic was horrible, obviously we were not the only ones that decided to go out for a drive during the holidays. Being time optimist I had planned for us girls to first go for a nice stroll in downtown and have lunch in a nice restaurant. We had a wonderful three days of Christmas this year. Sharing great food with friends and family combined with nice and cool weather so that we could use our fireplace made this Christmas a great end of a gloomy year. Since I moved to the USA I have found another meaning of Fox Mulder in the X-files "trust no one". Consumer protection in the USA is almost non-existant and corporations are allowed to prey on consumers with very little risk of being caught. My family is Swedish-American, I am Swedish and my husband is American. We lived together in Sweden for 17 years and we have lived in Florida for 5 years now. Christmas is a very important time of the year to maintain family traditions, we like our children to experience the Christmas traditions of the American as well as of the Swedish part of the family. Denials of B visa applications on the rise - How this can change your travel plans forever! This very important article was provided to EuroFloridian by Jan G Johansson Attorney & Counselor at Law 360 E 72nd Street #A1500 New York, NY 10021 Tel. 212-517-2750 Fax. 212-988-3285 E-mail; JJlaw@msn.com www.ImmigrationJJlaw.com. If you have any questions about this matter please contact Jan G Johansson for more information. This is a warning signal to you out there who have relatives thinking of visiting you for longer than three months or snow birds from northern Europe who lives in Florida during the winter season. To be added to this list are people who would like to spend a longer period of time with their boy or girl friends and business people who for a long time have been visiting the states on a regular basis but have been told that they have spent too much time in the United States and should get an appropriate visa. This is a correction to the last article about H&M opening a store in Sanford. Thanks to our Swedish friends of The Swedish Club of Orlando. EuroFloridian can add that not only do H&M open a Store in Sanford today, they also open a store in the Florida Mall in Orlando. Finally we will have an H&M store in Florida! Mosquitoes are as much a part of Florida as the sun and beaches. Unlike their Swedish relatives, myggor, the Florida mosquitoes are not only an annoyance but also a vector for viruses, deadly to humans and animals. There are two Swedish schools in Florida that welcome Swedish-speaking children. Since the dissolution of the Swedish – Norwegian union in 1905, Sweden and Norway has had a friendly quarrel. Swedes are jealous of the Norwegian oil and Norwegians are jealous of Swedish car brands, innovations and obviously now design! The Norwegian design agency, Anti, has designed a death metal inspired jeans brand, and of course the smart guys in the design bureau know that Sweden is a stronger brand name in design and fashion than Norway, whose most famous design still today is the folklore artifact “lusekofta”. Sweden’s mega successful jeans brands Acne and Cheap Monday obviously inspired and challenged the Norwegians who produced 666 pairs of unisex, black, cigarette jeans that they named, AntiSweden jeans. Obviously the success of the first Norwegian attempt to enter the super competitive international fashion market is by surfing on the Swedish success. There are some unwritten rules surrounding dinner invitations in different countries. Here are a few tips on how to be the perfect guest in a Swedish home. Black snakes, like this gentle giant the Indigo snake will keep the poisonous snakes, such as rattlesnakes off your property by eating them!